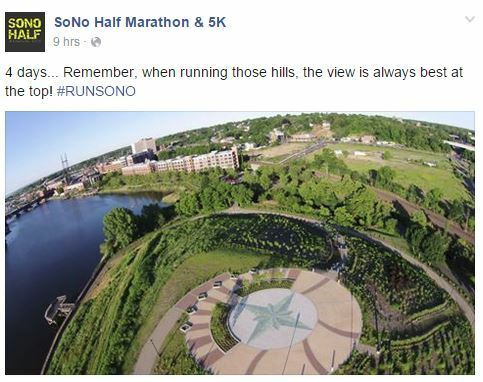 When the SONO Half posted on Facebook today that we are only 4 days away from the race, I kind of freaked out a bit. It’s crazy! Seeing as this is only my 4th official race, i’m definitely not one of those people who knows all the ins and outs of a race. I’m probably the exact opposite and as it’s getting closer, I have so many thoughts/questions buzzing through my head. So….I figured I’d write them down here. Not because I expect answers, but maybe by writing them down and organizing them, i’ll feel a bit better. My outfit – I think i’m pretty much good with this. As of now my plan is my green pants, black shirt, and a hat (either green or pink). If of course I find a cute shirt between now and then, the top half could easily change. Do I wear my belt? – During my long runs I have a belt that I wear, which allows me to carry water, fuel, my phone, and a key. Since the race has a bag check and water every mile, I’m thinking I probably don’t need my belt. A plus is that my pants have easy access pockets, so I can throw fuel in there. I’m thinking I’ll go belt-less. Compression socks – After hearing how wonderful they are, I bought a pair and ran with them on Sunday. Personally I felt like they made it harder and my legs didn’t necessarily feel any different (better) after the run. I had thought about running in them, but I think i’m going to pass. Maybe another time. Pre-race dinner – It’s pathetic how much time I am spending on this topic. It’s only 13 miles! 🙂 My preferred meal has been sushi. Strange, I know. The last thing I want is Italian food and pasta. The bf and I can’t seem to agree and we have about 6 guests coming too. Now we’re thinking hibachi. It’s not exactly what I want, but I just don’t know what else to do. So frustrating!! Post-race lunch – It’s all about the food. The same group is going to grab a bite after the race. Since it ends near downtown Norwalk, I’m thinking I should make a reservation. But where? Ever feel like restaurants are just eh? Fuel – I’m going to pick up a gel or two for during and probably go the sport beans route beforehand. So this is what happens when a Type A person does something they’ve never done before. Lots and lots of thoughts and questions. But like they said on Facebook, only 4 days to go, so for the most part, it is what it is. Right? Previous Previous post: Holy crap it’s getting close! Next Next post: I Did It!!!! !